As a Segway accident attorney in California, I know that Segways are a great form of transportation for our warm and, mostly, dry climate. Throughout the Golden State, including large cities like Los Angeles, San Diego and San Francisco, these devices provide a way to view the surrounding in the open air and even take tours for visitors and tourists. Most Californians are likely familiar with Segways, which are the two-wheeled motorized devices that have a post with handlebars. Segway riders stand on a small platform, and the Segways speed up when riders lean forward and slow when they lean backward. A Segway is a type of electric personal assistive mobility device, or EPAMD, that is recognized under California Vehicle Code Sect. 313. Riders have rules that they must follow that are codified in the California Vehicle Code. Segways are powered by a propulsion system and have maximum speeds of 12.5 mph. Segway riders have been injured in accidents with motor vehicles and in accidents caused by the way in which the machines respond to the position of the riders’ bodies. If you have been injured in a Segway accident, you may need to get help from a California Segway accident attorney. California views Segway riders as pedestrians. Under California Vehicle Code Sect. 467, the term pedestrian includes people who use EPAMDs, electric wheelchairs, motorized quadricycles and motorized tricycles. Under Sect. 21280 of the California Vehicle Code, the state’s legislature specifically recognizes that traffic congestion and air pollution are extreme problems in California’s cities. The government indicates that as a matter of public policy, reducing the number of automobile trips of less than five miles would greatly reduce the problems posed by pollution and congestion. The section also recognizes that the use of EPAMDs such as Segways has the potential to reduce both problems while also lessening harmful environmental impacts. As a result, the section was amended in order to promote the public’s use of EPAMDs as an alternative means of transportation. People who ride Segways must follow certain rules that are outlined in Sect. 21281.5 of the California Vehicle Code. Under the code, Segway riders must operate their Segways on roads, highways, streets, bicycle lanes, sidewalks or bike paths at reasonable speeds in relation to the weather, pedestrians and visibility conditions. They are also not supposed to operate their Segways at speeds that endanger other people or property or with willful disregard to the safety of others. Riders are also supposed to yield the right-of-way to people who are on foot, including those who are disabled and who are using assistive devices or service animals. While Segways are allowed and even encouraged by the state, it is important that people operate them prudently. This includes not going faster than is reasonable, riding too closely behind vehicles or failing to obey basic traffic safety laws. Even when a Segway rider is careful, drivers of motor vehicles may be negligent, resulting in death or severe injury to Segway operators. Several potential problems may occur when a person is riding a Segway. Many drivers fail to notice pedestrians who are crossing the street or who are traveling along the side of the road. Because of inattentive driving or distracted driving, motorists sometimes hit Segway riders or turn directly in front of them, causing them to collide with the vehicles. Accidents also may happen when vehicles are traveling too fast and are unable to slow down in time in order to avoid colliding with a Segway rider. In addition to driver negligence, some accidents result when the Segway on which they are riding is defective or malfunctioning. Because the electric propulsion system depends on the body positioning of the rider, Segways may suddenly go in reverse at fast speeds. They may also suddenly switch off, stopping suddenly if their batteries run out or if the machine senses that it might exceed its top speed. Riders may be thrown from their Segways, or they may fall to the ground with the EPAMDs when these incidents happen. This may result in the operator’s suffering serious injuries. Driver negligence may cause an accident with a Segway operator. When a motorist has failed to recognize the Segway rider, is speeding or is otherwise negligent, he or she may be held to be liable for causing the accident and resulting harm to the operator. An injured victim might be able to recover damages from the driver to compensate him or her for both his or her economic and non-economic losses that resulted. A personal injury attorney may be able to assess liability in an accident involving a motor vehicle and a Segway and then work to build a strong case for his or her client. Often, attorneys are able to negotiate settlements that are fair and reasonable, obviating the need to litigate the matters through trial. The amounts and types of damages that a person may be able to recover will depend on what happened, whether or not he or she shared any fault, the extent of his or her injuries and the losses that he or she suffered. When a Segway malfunctions and causes an accident, it is common for the manufacturer to argue that the person was not using the Segway in its intended manner. 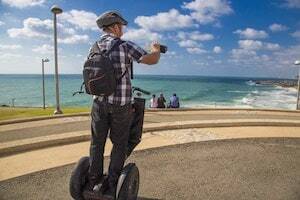 However, a personal injury attorney who is experienced with Segway injury cases may be able to show that his or her client used the Segway as it was intended and that the manufacturer knew or should have known of the risks but did nothing to correct them. This may allow the injured victim to recover damages. If you have been injured in a Segway accident anywhere in California including San Diego, Los Angeles or the San Francisco Bay area, you may need legal help. Whether your accident was caused by the negligent actions of a motorist or by a sudden malfunction of the machine, it may be possible for you to recover damages. Contact a California Segway accident attorney to schedule your consultation.